This week for our 100 Acts of Kindness Challenge we are focusing on doing kind things for our friends. My kids really enjoy sharing the things they love with their friends. My son is very obsessed with Star Wars and Legos right now, but realizes that not every single kid he knows likes those things as much as he does. 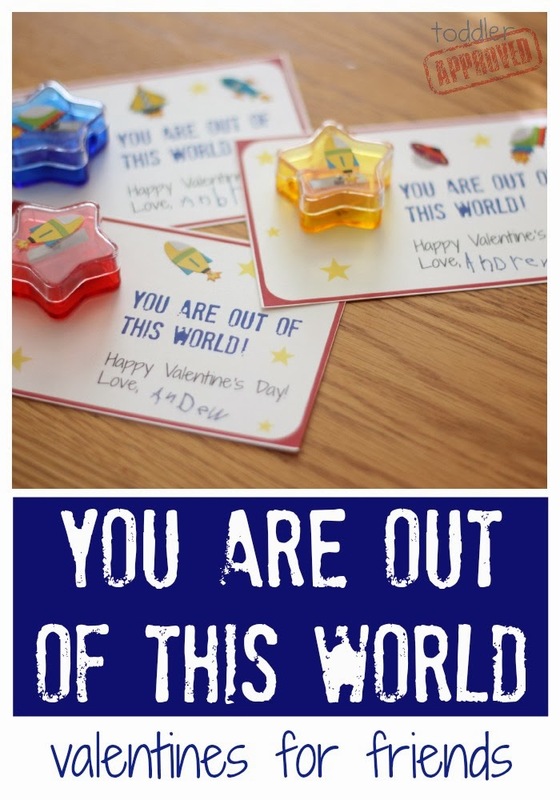 We decided to make some cute little "You are out of this world" valentines for some of his friends using star pencil sharpeners and space stickers we found. These still kind of go with his favorite Star Wars/Space theme... but still work for his friends that aren't in love with Star Wars figures and terminology. Before we started creating, we made a giant list of my son's friends and then prioritized which friends we were giving valentines to this week. 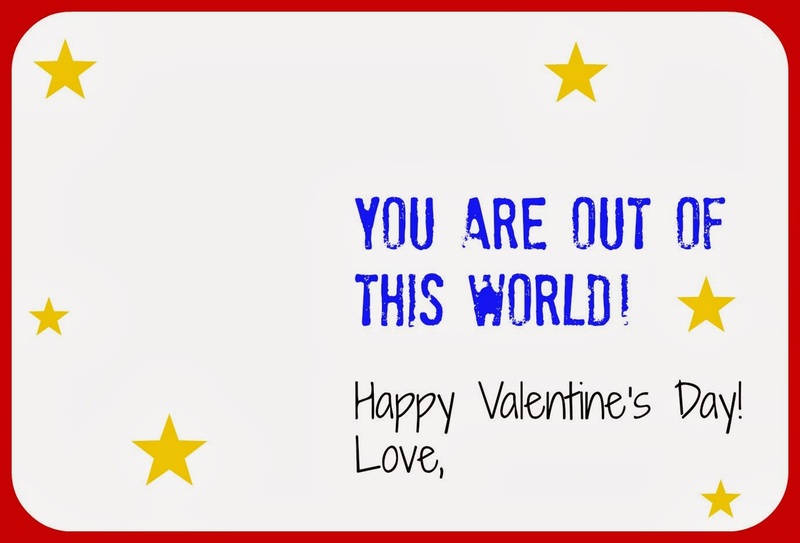 Then we printed out this "You're out of this world" valentine printable (you can download one here). You can also download a sheet of 4 here. Next we added names to the valentines. Then we stuck the star pencil sharpener on with tape (you could also use an eraser or use this as a bag topper... scroll down below to see what I mean). We jazzed everything up with some stickers and then these were ready to pass out! We think it is fun to hand deliver valentines to friends or drop them off on doorsteps and do some doorbell ditching (my son's favorite activity right now). If you print off the "out of this world" printables and tape them to the top of a ziploc bag you can also use them as bag toppers. We found some cool space rockets at Oriental Trading and gave them to friends who love space and rocket themed things. If we were super organized this year (which we aren't), it would've been fun to do the 14 Days of Valentines to another family and give them a valentine every day from February 1st to February 14th. Wouldn't that be such a sweet way to show kindness to friends? I am currently doing the #14daysofvalentines over on Instagram just with my kiddos though (who I consider to be some of my best friends), so come over and check them out if you want to get some inspiration.